Mercury will reach its greatest separation from the Sun in its February–March 2019 evening apparition. It will be shining brightly at mag -0.5. From Fairfield , this apparition will be reasonably placed but nonetheless tricky to observe, reaching a peak altitude of 17° above the horizon at sunset on 27 Feb 2019. The table below lists how high above the horizon Mercury will appear at sunset over the course of the apparition. All times are given in Fairfield local time. A graph of the angular separation of Mercury from the Sun around the time of greatest elongation is available here. Mercury's orbit lies closer to the Sun than the Earth's, meaning it always appears close to the Sun and is lost in the Sun's glare much of the time. It is observable for only a few days each time it reaches greatest separation from the Sun – moments referred to as greatest elongation. These apparitions repeat roughly once every 3–4 months, taking place alternately in the morning and evening skies, depending whether Mercury lies to the east of the Sun or to the west. However, some times of the year are more favourable for viewing Mercury than others. From Fairfield, it reaches a peak altitude of between 8° and 21° above the horizon at sunset during each evening apparition, depending on the time of year. During its February–March 2019 apparition, it will peak at 17° above the horizon at sunset on 27 Feb 2019. This variability over the course of the year is due to a combination of two factors. At all times, Mercury lies close to a line across the sky called the ecliptic, which is shown in yellow in the planetarium above. This line traces the path that the Sun takes through the zodiacal constellations every year, and shows the plane of the Earth's orbit around the Sun. Since all the planets circle the Sun in almost exactly the same plane, it also closely follows the planes of the orbits of the other planets, too. When Mercury is widely separated from the Sun, it is separated from it along the line of the ecliptic. But, at different times of year, the ecliptic meets the horizon at different angles at sunset. This would translate into Mercury being at different altitudes above the horizon, even if its separation from the Sun was constant. 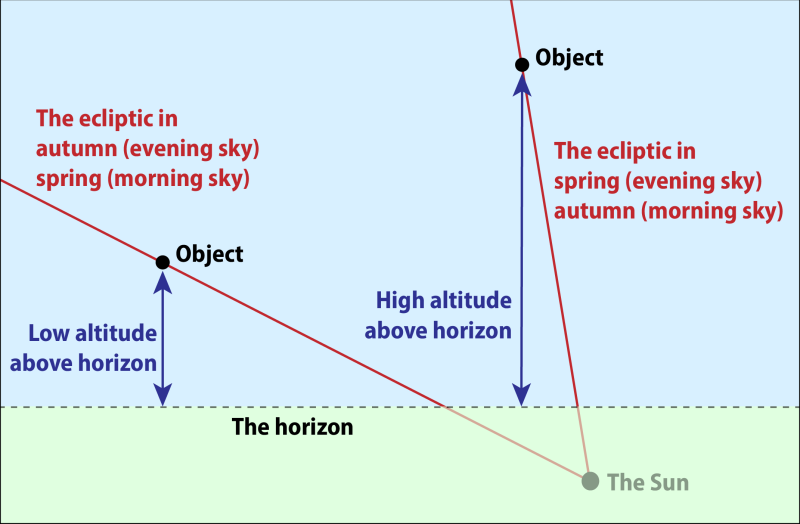 If the ecliptic meets the horizon at a shallow angle, then Mercury has to be very widely separated from the Sun to appear much above the horizon. Conversely, if the ecliptic is almost perpendicular to the horizon, Mercury may appear much higher in the sky, even if it is actually much closer to the Sun. The seasonal dependence of this is that at sunset, the ecliptic makes its steepest angle to the horizon at the spring equinox – in March in the northern hemisphere, and in September in the southern hemisphere. Conversely, it meets the horizon at its shallowest angle at the autumn equinox. Because the seasons are opposite in the northern and southern hemispheres, a good apparition of Mercury in one hemisphere will usually be badly placed in the other. At sunrise, these dates are also inverted, so that for morning apparitions of Mercury, the ecliptic makes its steepest angle to the horizon at the autumn equinox, and its shallowest angle to the horizon at the spring equinox. The orbits of the planets Mercury, Venus and Earth, drawn to scale. The orbit of Mercury is significantly non-circular. Click to expand. A secondary effect is that Mercury is unusual among the planets for having a significantly non-circular orbit, which varies in its distance from the Sun by 52% between its closest approach (perihelion, labelled P in the diagram to the right) and greatest distance (aphelion, labelled A). This means that Mercury's separation from the Sun at greatest elongation varies, depending where it lies relative to the aphelion or perihelion points of its orbit. 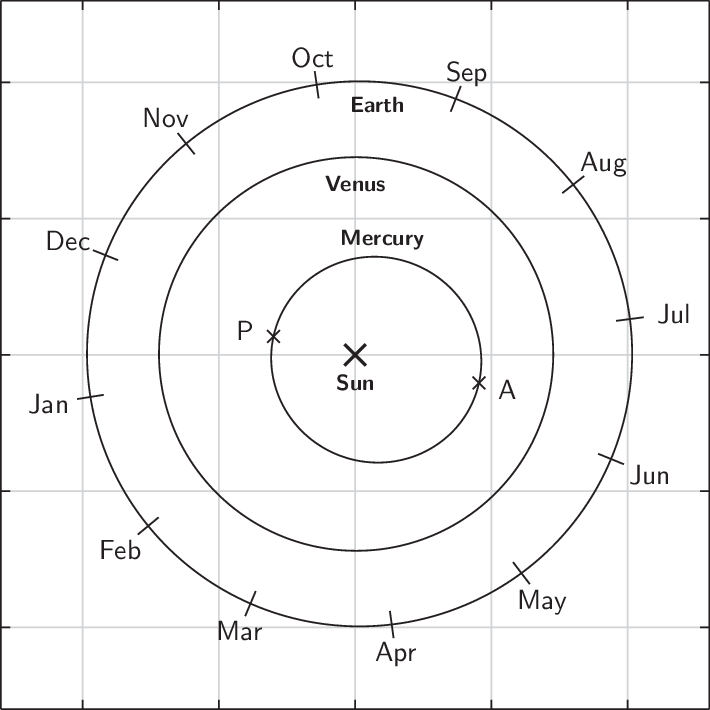 In mid-September and mid-March, the Earth is well placed to view the long axis of Mercury's orbit edge-on. So, if Mercury appears in the evening sky in mid-September, or in the morning sky in mid-March, then it appears more widely separated from the Sun than usual. Specifically, at each apparition, Mercury reaches a separation from the Sun of between 18 and 28°. During its February–March 2019 apparition, it will reach a maximum separation of 18° to the Sun's east at greatest elongation. The maximum altitude of Mercury during all its evening apparitions between 2000 and 2050, as a function of the day of the year on which greatest western elongation occurs. Different colours show the altitudes observed from different latitudes. Click to expand. The two effects described above are of similar magnitude, though the inclination of the ecliptic to the horizon is the more significant. They conspire to make Mercury much easier to observe from the southern hemisphere than from the north. In the southern hemisphere, apparitions of Mercury which occur when the ecliptic plane is favourably inclined to the horizon also coincide with apparitions when Mercury is close to aphelion. In the northern hemisphere, unfortunately the opposite is true: when the ecliptic plane is favourably inclined, Mercury is close to perihelion. 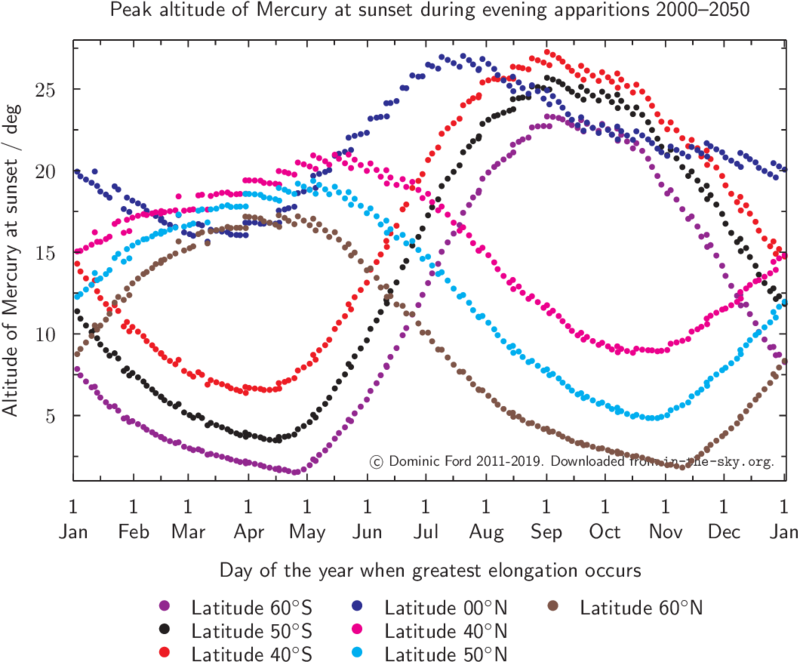 The plot to the right shows the maximum altitude of Mercury during all its evening apparitions between 2000 and 2050, as observed from a range of different latitudes on Earth. The highest altitudes are seen exclusively from the southern hemisphere. Mercury 23h42m10s -00°19' Pisces -0.5 7.2"
Sun 22h37m -08°40' Aquarius -26.7 32'18"